This visualisation demonstrates just how significant the participatory nature of the the internet is. Of the 61% who read their new online, 35 % actually contribute to the creation of the news, commented about it or used to social media to promote it to others. The other point of interest is that people 'graze' for their news content and this is the nature of the medium. 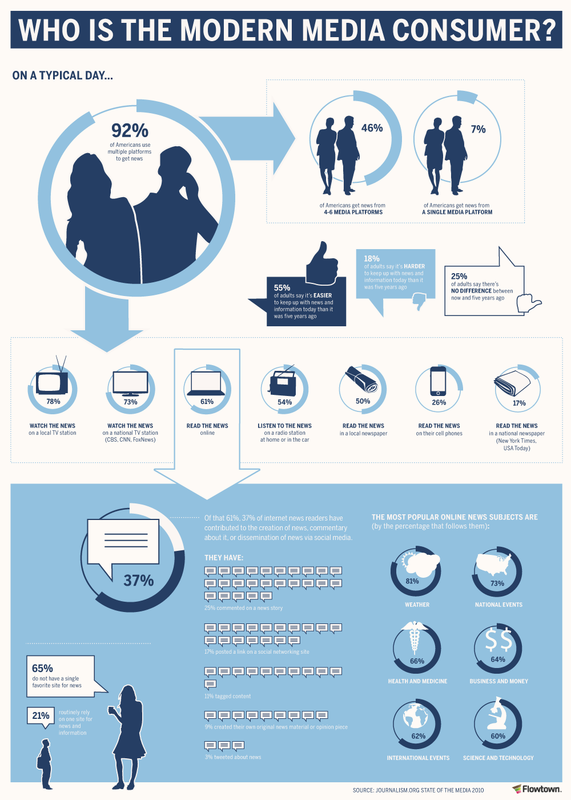 Only 21% claim to routinely use one site for news and information. These findings are hardly surprising given the development of the semantic web and the expectation people have to have the news come to them rather than to have to go searching for it. Modern browsers all have the ability to subscribe to news and interest feeds so once a subscription has been set up the news follows the consumer rather than the other way around. User 'portals' such as Feedly and aggregator sites and software make the ability to set up a personalised menu even easier. I suspect that Mr Murdoch and I might disagree about sites that point to to another's copy? It is of course a question of degree. There is a marked difference between a headline and short 'teaser' paragraph linked back to the original article and copying an article in its entirety on a third party site. I am all for the former but the latter is simply digital plagiarism. I wrote a short piece about the the need to take time out in this digital world and let the grey matter recharge. The gist of the article was that creative processes need alpha stimulation as opposed to a constant bombardment of digital stimuli through earpieces, hand helds and every other digital channel known to man. The next step along the way is brain computer interfacing. I for one don't really want my brain connected to my laptop. I would much prefer my brain to be connecting to the sights and sounds around me. Which lead me rather nicely into a deliberation on the long term future of blogging; is there one? In this age of the "Now", where the short term immediacy of a 'tweet' or facebook entry passes for dialogue, are blogs still a relevant channel? Emily Gordon of Emdashes compares Facebook and Twitter to a continuous snowstorm but says the snow will melt eventually. Blogs will always prevail as they provide a digital space to make more lasting contribution in a digitally creative manner.